Sen. Hillary Rodham Clinton (center) welcomes United Methodist Bishops (from left) Roy I. Sano, Gregory V. Palmer, Janice Riggle Huie and John R. Schol to her office. Two United Methodist bishops spent a day in the halls of Congress, talking about issues important to the church and forming bridges between the faith community and lawmakers. with members of Congress to discuss issues important to the church. 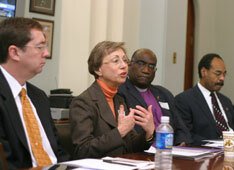 Bishop Janice Riggle Huie, Houston Area, and Bishop Gregory V. Palmer, Iowa Area - president and president-designate of the Council of Bishops - met with senators and representatives before a reception for United Methodist members of Congress, hosted Jan. 25 by the United Methodist Board of Church and Society. The reception was held at the United Methodist Building on the National Mall, adjacent to the U.S. Capitol and the Supreme Court. The bishops met with Rep. James E. Clyburn, D-S.C. and majority whip; Rep. Emanuel Cleaver, D-Mo. ; and Sen. Hillary Rodham Clinton, D-N.Y. The religious leaders also met with staff from Speaker of the House Nancy Pelosi's office and Stephen Higgins, general counsel to Sen. Jon Kyl, R-Ariz.
"The highlight of the day for me was discovering how many of our elected representatives on both the Senate side and House side really are interested in some of the concerns virtually all United Methodists are concerned with, particularly around children and care for the poor," Huie said. 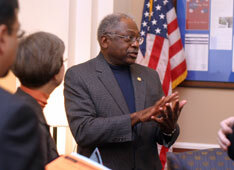 Rep. James E. Clyburn talks to United Methodist leaders in his office. Clyburn, and Cleaver, a United Methodist pastor, are part of a faith working group assembled by Pelosi. "There seems to be some disconnect between us (Democrats) and faith voters," Clyburn told the bishops. "Faith is second nature to our members; it is who we are and what we are." New members of Congress need members of the faith community to educate them, said Acacia Salatti, a member of Clyburn's staff and a graduate of Emory University's Candler School of Theology, a United Methodist seminary. "I was just tremendously impressed with the personal faith of the congresspersons that we met this day," said Palmer. The lawmakers were open to people of faith and they understand that nothing will move forward in this nation "without meaningful collaboration with people that differ ideologically, politically and theologically." Jim Winkler, top executive of the United Methodist Board of Church Society, sat in on the meetings with other board staff members and told lawmakers about the agency's six 2007 legislative priorities. Expanding funding for family planning. Ending the war in Iraq. Providing access to primary health care for all. UMNS photo by Jay Mallin. 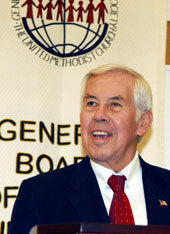 Afterward, Lugar said The United Methodist Church "has been the foundation of my faith." Both Clinton and Lugar made it a point to visit the reception between votes on the floor of Congress. "I am a Methodist and have remained a Methodist because I find it satisfies both my personal need - my own faith journey - as well as my responsibilities and obligations to the larger community," Clinton said. She congratulated the church for its fight against malaria and HIV/AIDS as well as its commitment to mentoring and reaching out to children. "I wish all of you well," she said. "It is a great privilege to me to be part of this wonderful church and all that it has meant to me and meant to so many others." Sen. Richard Lugar: "The foundation for the building of my faith..."
Sen. Hillary Rodham Clinton: "It's a great privilege for me to be part of this wonderful church..."
Bishop Janice Riggle Huie: "They were eager for prayer..."
Bishop Gregory V. Palmer: "I was tremendously impressed with the personal faith..."